The 'State Machine Diagram' is a behavior diagram showing states and their transitions. 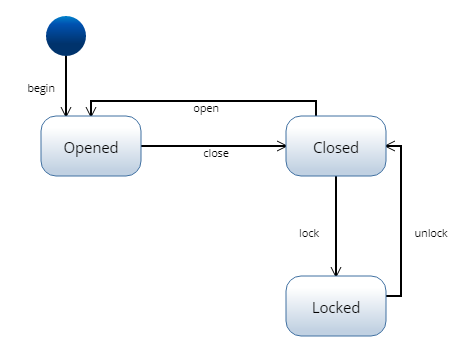 Creating State Machine Diagrams Using 'Diagrams View' in Innoslate, you can create a new 'State Machine Diagram'. Adding a State A 'State' construct can be added to a 'State Machine Diagram' via drag-and-drop. Adding an Initial State An 'Initial State' construct can be added to a 'State Machine Diagram' via drag-and-drop. Adding a Final State A 'Final State' construct can be added to a 'State Machine Diagram' via drag-and-drop. Adding a Transition A 'Transition' construct can be added to a 'State Machine Diagram' via drag-and-drop. The ‘State Machine Diagram’ is a behavior diagram showing states and their transitions. Creating State Machine Diagrams Using ‘Diagrams View’ in Innoslate, you can create a new ‘State Machine Diagram’. Adding a State A ‘State’ construct can be added to a ‘State Machine Diagram’ via drag-and-drop. Adding an Initial State An ‘Initial State’ construct can be added to a ‘State Machine Diagram’ via drag-and-drop. Adding a Final State A ‘Final State’ construct can be added to a ‘State Machine Diagram’ via drag-and-drop. Adding a Transition A ‘Transition’ construct can be added to a ‘State Machine Diagram’ via drag-and-drop.